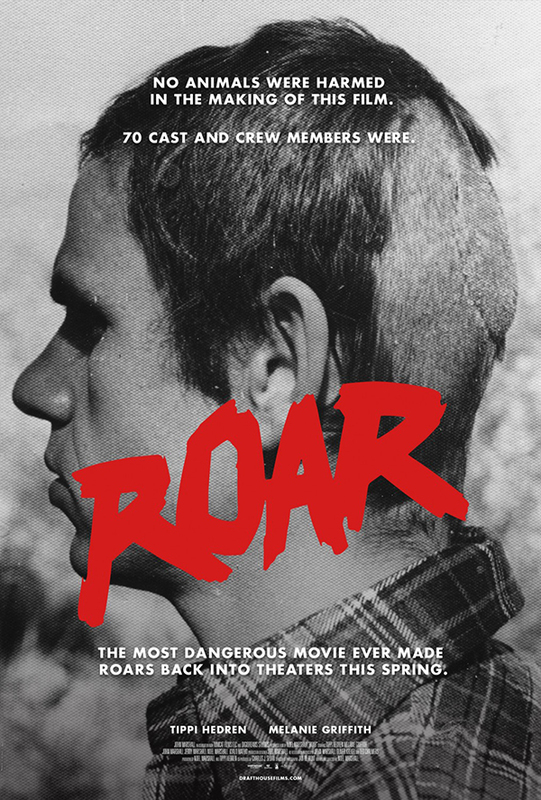 Roar 1981 – Is an unbelievable film written and produced by married couple Tipi Hedren (The Birds) and Noel Marshall. 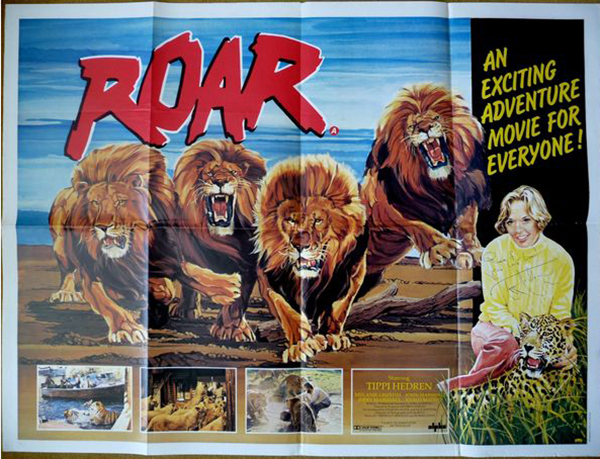 The film also starred Tipi’s real daughter Melanie Griffith and Marshall’s 2 sons John & Jerry. 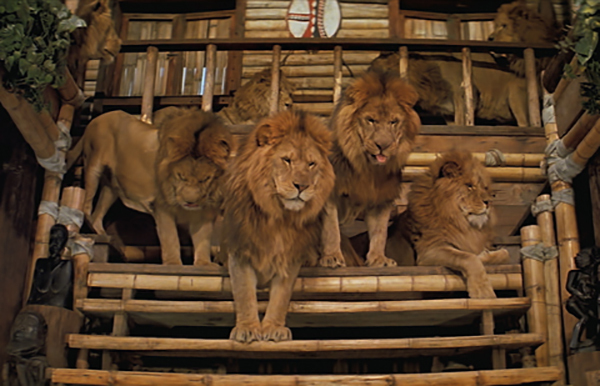 Here’s the basic plot; “Hank (Marshall) lives contentedly with his wild animals: four tiger cubs, two elephants and 110 tigers, lions, leopards and cheetahs. One day his family (wife and 3 children) arrive to visit him. 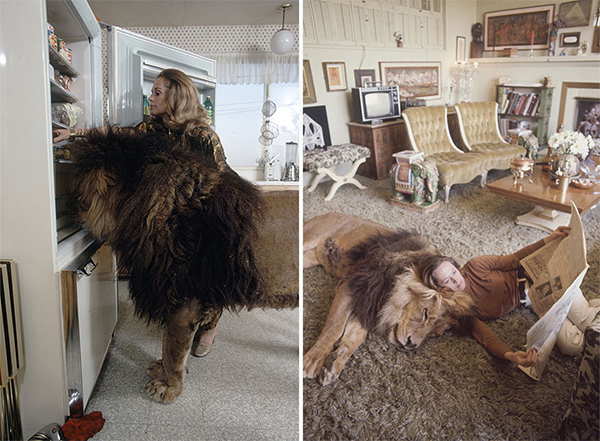 The only trouble is he is not at home, but all his animals are. 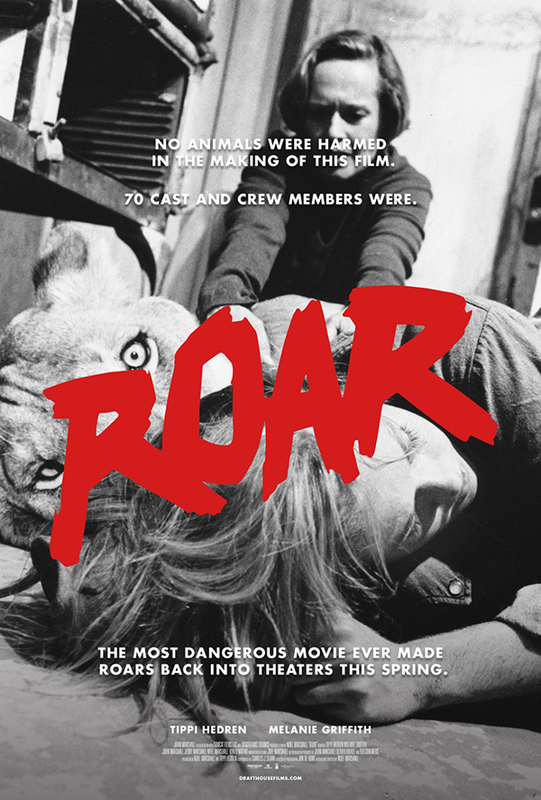 The visiting family are in for one shocking experience.” That’s right 110 lions, tigers and cheetahs – all untrained, all wild as hell. 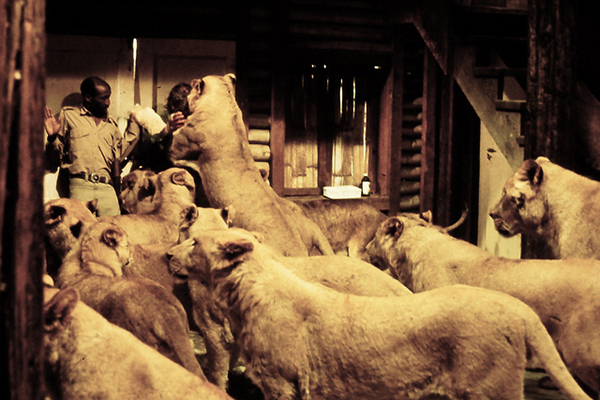 During filming over 70 of the cast and crew were injured. 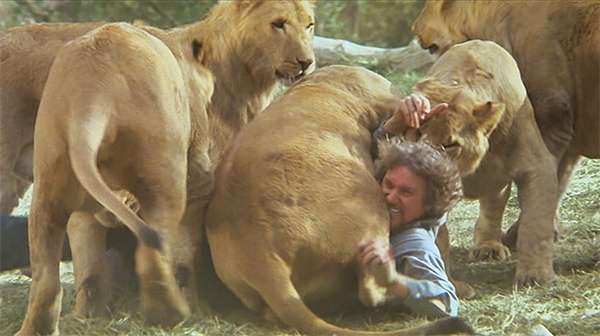 Cinematographer Jan de Bont (later director of Speed and Twister) had his scalp lifted by a lion, resulting in 220 stitches. Tippi Hedren received a fractured leg and scalp wounds. This occurred after an elephant bucked her off its back while she was riding it. 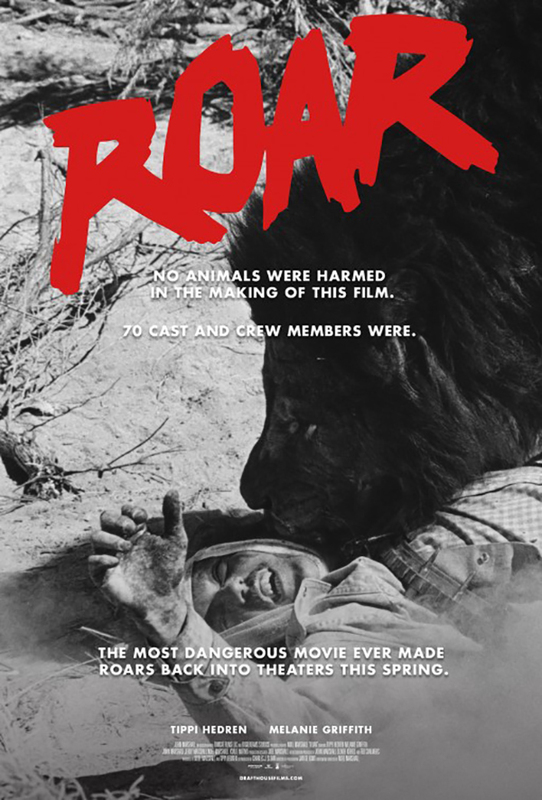 She was also bitten in the neck by a lion and required 38 stitches (this can also be seen in the film). Hedren’s daughter was also attacked, receiving 50 stitches to her face; it was feared she may lose an eye but in the end the wound was not disfiguring. Noel Marshall was attacked so many times that he eventually was diagnosed with gangrene. The animals fared much better. 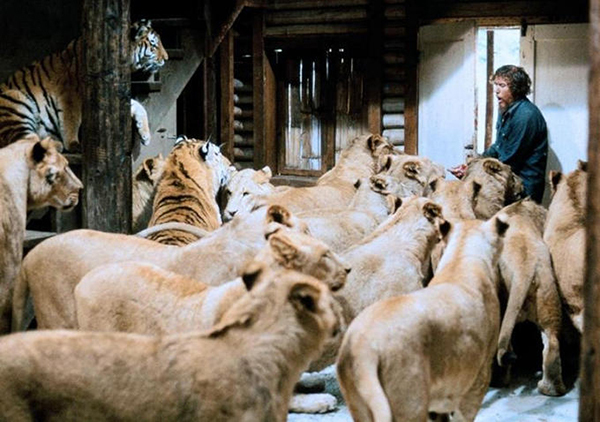 Tipi was and is a firm animal rights activist and has run a lion preserve in Africa for well over 30 years, continuing to this day. 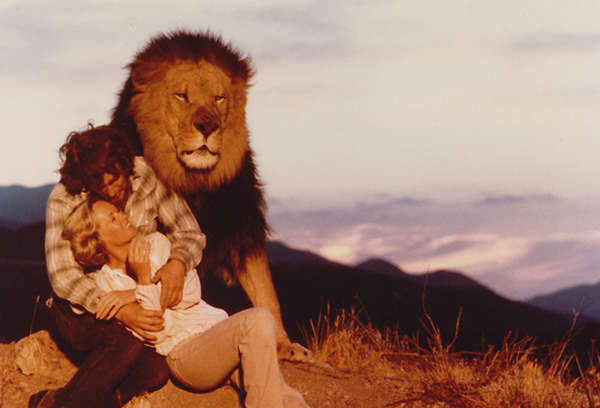 She felt the film would showcase the beauty and quiet majesty of these animals – she was partially right. What it actually shows is the natural danger and untameability of the animals. Why anyone would consider working with these big cats is a good idea is beyond me. 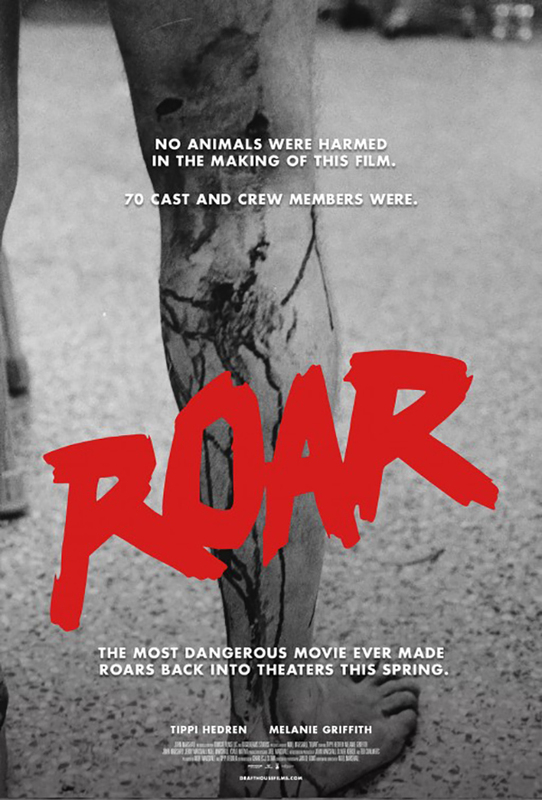 Alamo Drafthouse has rescued this movie from obscurity and released it across the country with a new print and a crazy poster campaign. It looks amazing and insane. 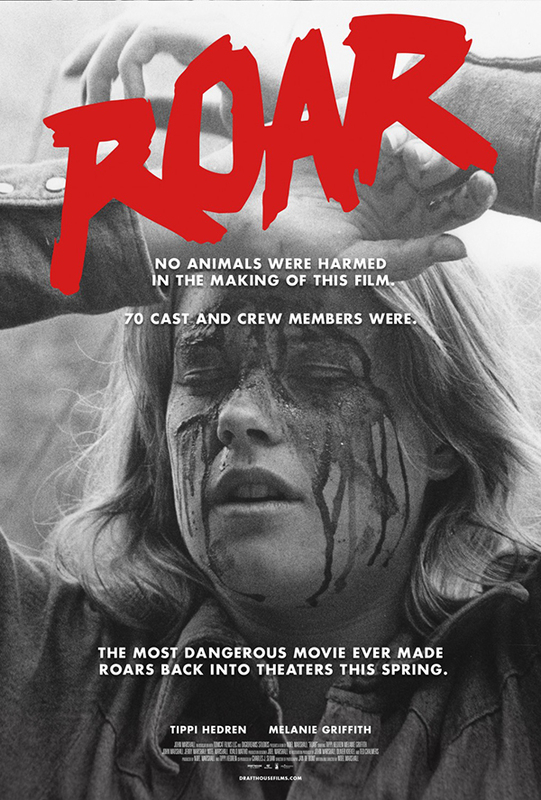 And remember “No animals were harmed in this movie” – only the crew. Asia’s a big place and every boy band from Iran to Pakistan wanted to be the Beatles in the 1960’s. The girls wanted to be Lulu or Nancy Sinatra or any other hot anglo singer. American and British influences are everywhere, in terms of dress, style, band names and song selection. One thing they didn’t emulate so closely was their 45 rpm cover art. It’s all over the place and just plain great.